Activision Blizzard, EA, and Take-Two all fell heavily on Wednesday. 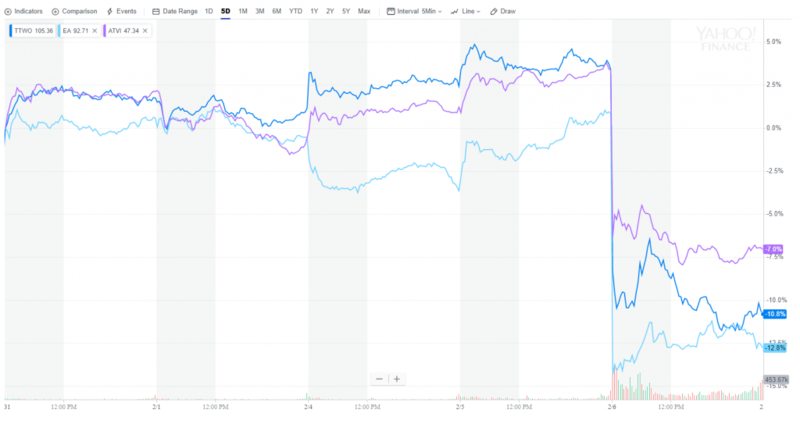 Just two days after the release of Apex Legends, the latest hit in the battle royale segment, major gaming stocks took a dive. Shares in Activision Blizzard, EA, and Take-Two, three of the biggest gaming publishers in the industry, all plunged more than 10 percent in trading on Wednesday. Most American indices were off on Wednesday, with the tech-heavy Nasdaq down 0.36 percent. But that doesn’t explain the heavy hit those three companies took. Both Take-Two and EA released guidance earlier in the week that came in short of analyst expectations. And it can’t be ignored that the selloff is happening amid the sudden rise of Apex Legends—which sold a million copies in less than eight hours after release. The combination of weak guidance and more competition from battle royale games seems to have investors spooked about the status of more traditional games. Over the last two years, gamers have increasingly flocked to the battle royale segment. The trend kicked off with the release of PlayerUnknown’s Battlegrounds in 2017, but then went into overdrive with the release of Fortnite later that year. Fortnite slowly climbed to the top of the market, reaching 125 million users by mid-2018, making it possibly the biggest PC and console game in the world. The success of Fortnite spawned a host of battle royale copies, including offerings within traditional games like Activision’s Call of Duty: Black Ops 4 and Take-Two’s Red Dead Redemption 2. But none were able to knock Fortnite off the top spot until Respawn Entertainment’s Apex Legends came around. Almost right after release, Apex Legends bumped Fortnite off the top spot on the streaming site Twitch. Respawn Entertainment released the game with a strong marketing campaign that focused on contracting with big-time streamers, like Ninja, to play the game. The title’s free-to-play model also seemed to draw in new players. The interesting thing about Wednesday’s selloff was how hard EA stock was hit. EA acquired Respawn Entertainment in late 2017 and should stand to benefit from the popularity of Apex Legends. EA’s recent sales of games like Battlefield did come in below expectations, and it’s possible that the drop in EA stock was simply due to investors pulling out of gaming as a sector without discerning between those with more exposure to battle royale. But another explanation could be that the meteoric rise of battle royale games has shown investors how fickle gamers’ tastes have become. Apex Legends might be on top of the world right now, but if the past few years are any guide, it may not be in that spot for long.